I feel really fortunate having such great parks to hunt here in the Kansas City area. Kansas City Parks and Recreation deserve a lot of positive credit for the work they have put into restoring the parks. If you have not visited our parks recently, I think you may be surprised by the improvements. The title makes it sound like I’m killing the silver coins, but not exactly. I went over two weeks without finding a silver coin. That’s how it goes a lot of the time. You spend your time finding a place with silver and then you pound it. Then you change up your technique and pound it again. You hit the place so many times you worry your mail may start being delivered there. Then your out searching for a new place to hit. It sounds easy until you think about the city your hunting has several metal detecting clubs who have been hitting it for 20+ years. I’m constantly surprised by how much silver is still out there, but its getting pretty thin. Soon someone is going to develop a new technology and even more silver will be found. This morning I found two mercs and a wheat that was less than 5″ deep. They were hiding under a old style pull tab and a piece of iron off to the side. I was running manual 24 and using a very tight discrimination pattern. (That change of technique I was writing about) All I got was a brief hit of 10-45 and 18-45. I could ony pick up those numbers one in 10 other trash numbers in my swings. I noticed a strong low tone there to so I dug it. Then I started getting 12-45, 12-47, 12-46 and a few other numbers. I pulled the first Merc and there was still an occasional silver number. So I dug the iron and then I found the other Merc and wheat. I wonder how many times I’ve passed silver thinking it was just falsing? I hope your finds are plentiful. Good luck! 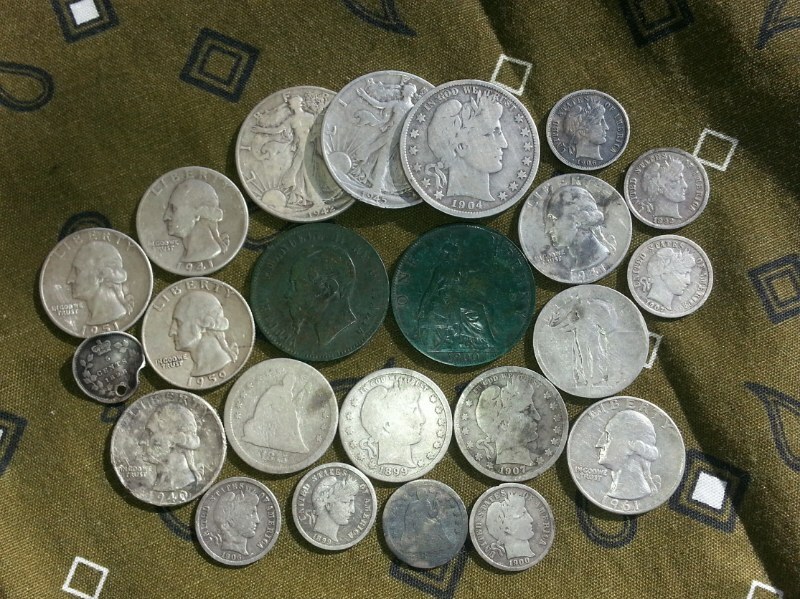 I know its been a while, silver finds were going slow and then boom I start banging them every time I went out. Crazy! I started hitting a large, spread out old park. It follows the river bluffs and the open grassy places have been pounded over the years by other metal detectorist. They didn’t find everything 🙂 I cannot emphasize enough about going slow and check out every deep signal. You won’t cover a lot of ground, but I bet you won’t leave much behind. I pulled a silver Washington quarter out of a nail infested hole. I could tell there were multiple targets in an eight inch area, but in two different angles I would hit silver dime, quarter numbers. I hadn’t found anything but an old wheat so I dug it. I pulled two nails with large heads, dang. My pinpointer still chattered in the wall and out came a silver Washington quarter. Keep in mind, I dig at least 5 or so deep nails because I will get coin numbers with iron numbers. So it does pay off to dig them. Besides, it would bug me to death not knowing if there was a silver in the ground or not. While I was there I noticed hiking trails leading into woods along the bluffs. So what the heck, I headed out. I had good luck hitting the woods in another park and it payed off here. I found several Mercs and three Barber dimes. It’s such a thrill to find silver from the 1800’s and early 1900’s. To top it off I found a 1875 Seated Quarter (very, very worn) on the edge of a trail today. I couldn’t believe it, I was stunned! After texting a pic to my brother and friend I went on. I found a 1925D Merc about 20 yards further down the trail. Then I covered about a quarter mile of more trails and found nothing. Thats how it is sometimes. I’m at 71 silver coins for the year. My hopes of hitting a 100 is fading. I need to find 3 more to match my last years finds. I did find my first War Nickel of the year. I also found a barely readable 1916 Buffalo Nickel. I just don’t seem to find much of those. I remember thinking a little while back that my silver rosie count was down. It looks like I’m making up for it now! I managed to pick 5 of them recently hunting around 1950’s schools. These are usually the least fruitful for me since most coins from the 50’s are not very deep and easily picked up by most detectors. The ones I did find were in fields behind schools or in oddball places on the property. It takes a lot of time to cover these areas and the least fun to hunt due to the taller grass. I picked up a silver quarter in an old park in very dense trash. The readings were so iffy I thought it would be a clad quarter at best. According to my records I’m one silver coin up from last year at this time. I’m still determined to hit my goal of 100. I’m still kicking around the idea of upgrading to a larger coil since most of the Etrac bloggers I’ve followed already have. So there must be some kind of an advantage there! I also picked up a child’s silver ring at 4″. It rang up mostly like a modern penny which I don’t dig much. This one rang up differently enough it made me curious. It goes to show you never really know what you might be passing up! So far 2015 has been good to me metal detecting. An arctic front was heading our way bringing snow and really, really cold temperatures. Saturday was misty with occasional light sprinkles with temperature near 38 degrees. I debated taking my etrac out into these conditions and shorting it out. Coughing up $700+ to replace board (Thats what I’ve read) just seemed chancy to me. Still the thought of a week or more of arctic weather, rock solid frozen ground bummed me out too. So I decided I would go and chance it. I decided on another old city park with really no outstanding features other than a recently built tot lot. Google satellite revealed possible old impressions of what might of been sidewalks now long gone that meandered through the park. I wondered how much human traffic occurred in this park from the early 1900’s? Only one way to find out! I hope everyone had as good a weekend as I did. My youngest son came home from college this weekend to spend time with Dad. So while he slept in I went metal detecting. I’ve been dieing to find a silver quarter this year. Most Metal Detectectorist ( is that even a real word?) strive to find silver half dollars, silver dollars and even gold coins. Heck, I feel lucky to find silver dimes! This weekend I found 3 silver Washington quarters! Not only is that the most I found in a year, I found them all in one weekend. I also found two silver Roosevelt dimes to boot! To make the weekend even sweeter, me and my son found 27 Morel Mushrooms!! I hope everyone’s luck was as good as mine! I’m on my way to that magical 30! !